There are a lot of reasons why a tree must come down. Storms, disease and even changes to your landscape may all require the removal of one or more trees from your property. Depending on the size and location of those trees being removed, the job can be simple – or it may become a complicated endeavor. Not just anyone can – or should – be removing trees from your property. Tree removal is a specialized industry that requires professional training to ensure the job is completed as efficiently and safely as possible. Fully trained and certified, our expert tree removal specialists can handle the removal of any tree; no matter the size. 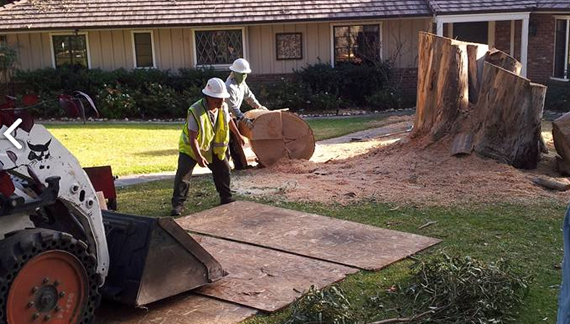 When it is time to remove a tree from your property, be sure the job is handled correctly by using a qualified removal specialist who has been trained in every aspect of the job. Tree removal can be complicated and it can be dangerous unless it is handled by experts trained in every aspect of the job. Four Seasons Landscaping is a commercial tree removal company, with many years experience, safely and expertly removing all types of trees.